KAMP President Louis Hill (left) presented a scholarship to WKU student Hannah Caudill. 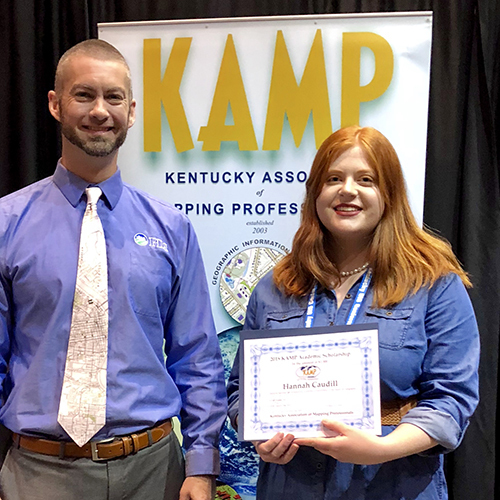 WKU student Hannah Caudill of Elizabethtown was awarded the $1,000 GIS scholarship by the Kentucky Association of Mapping Professionals (KAMP). Caudill is majoring in Geography/Environmental Studies with a Certificate in GIS. Louis Hill, President of KAMP, presented the award at this year’s Kentucky Geographic Information Systems (GIS) Conference, which was held Oct. 23-25 at the Sloan Convention Center in Bowling Green. The GIS scholarship is a statewide scholarship for students attending full-time at a two-year or four-year higher educational institution in Kentucky. Only one student is selected for the scholarship annually. Growing up, Caudill’s life has been geography itself living in North Dakota, Ohio, Virginia and New Mexico before arriving in Kentucky upon entry into WKU. She plans on pursuing a master’s degree in either Biogeography or Cultural Geography and wants to pursue a career with the Environmental Protection Agency or the Centers for Disease Control and Prevention. Her desire has always been to help society and make individuals’ lives and the environment a better place for us to live. Since KAMP began offering the GIS scholarship in 2013, five of the six awardees have been students from the Department of Geography and Geology’s Geographic Information Systems/Science programs and have found employment after graduation in GIS with 3-GIS, Hyrdomax USA, Kentucky Division of Stormwater Management and Parallon Business Solutions. The scholarship is a way for GIS professionals in the Commonwealth to assist a deserving student studying GIS at a higher education institution in Kentucky.